It’s possible you may have been going about your business entirely unaware that one of those rare calendar events is upon us. 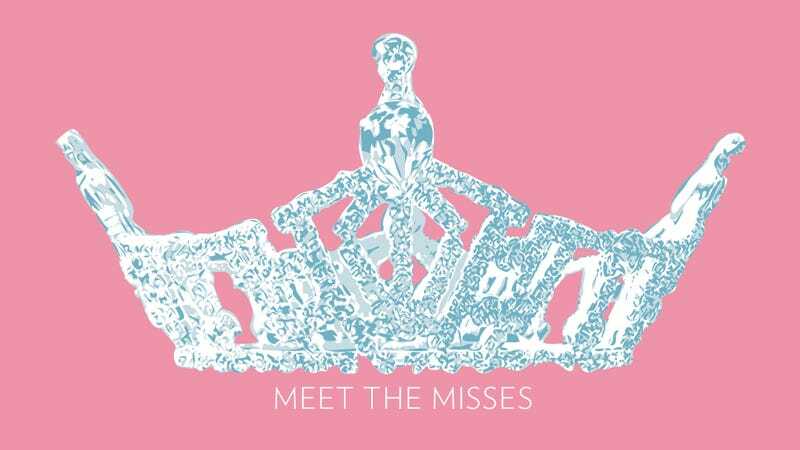 Much like the appearance of Halley’s comet or the upcoming convergence of Thanksgiving and Chanukah, Sunday night marks the second Miss America pageant of 2013. I know, right? Mind: blown. So here we are, just eight months later, all abuzz with excitement over who will win the coveted tiara. I mean scholarship. One of the umpteen aspiring broadcast journalists? The Princeton student? The clogger? The “electro-acoustic violinist?” Or one of the two – count ‘em! – Bollywood dancers? Personally, I’m waiting for the day contestants start embracing more contemporary talents like Candy Crush and competitive hot dog eating. But I digress. The mainstream media has already pounced on the tattooed, squirrel-cooking Army sergeant Miss Kansas who aspires to be a prosthodontist (a sentence I feel very confident has never, ever once been uttered before this very moment) and the pretty Miss Iowa who was born with one arm, but don’t you worry your pretty little head. I’ll tell you everything you really need to know. Like…is there a classical pianist who will ham it up while wearing a thigh-skimming, backless, sequined evening gown? CHECK. That would be Miss Wisconsin. Did Miss New Hampshire win a preliminary talent competition while wearing a dress perhaps best described by my friend Hilary as looking like “Rainbow Brite threw up”? Why, yes. Yes, she did. Did Miss Florida go through with her baton twirling routine despite being in a knee brace after tearing her ACL in rehearsal? Yuppers! AND SHE WON. You go, girl! Does Miss Virgin Islands intend to dazzle us with a combination of baton, hoop, AND flag twirling? Um, duh! WHILE IN TOE SHOES, YO! Is the spork dress still alive and well? Of course it is. God bless Miss Iowa. Quizzical Headshot For Which the Caption Should Be, “I Don’t Know. Do You Think I Should Be Miss America?” Miss AR. The only thing missing is a shoulder shrug. Headshot Most Likely To One Day Be Pored Over, Framed, on a Table on The Bachelor set: Miss Georgia, aka JV Jessica Simpson. Runner-ups: Miss WV and Miss TN. Most Likely To Be on the Real Housewives Franchise: Miss Montana. Best Eyebrows: No contest. Miss New York. Contestant Who Just May Have Been a Little Goth in High School: Miss Missouri. The Vonda Kay Van Dyke Honorary “Best Miss America Name” Award. I’m sad to report that with the exception of Indiana’s Terrin Zoe Thomas and New Mexico’s Alexis Victoria Duprey, there was an underwhelming showing amongst three-named contestants this year. So I’m giving the award to Miss AL, Chandler Champion (at left), with honorable mention to Miss Nebraska, JaCee Pilkington and Miss South Dakota, Tessa Dee. And Props to Jezebel commenter Allibgood, from whom I learned the awesome Create Your Own Pageant Name game: Characteristic associated with femininity plus single syllable female name plus Presidential last name. That’s Perky May Van Buren to you, ok? Academic Credential Perhaps Best Left Off the Ol’ Resume: Miss NH won a Burger King scholarship, while Miss NV’s bio boasts that she was her intermediate school valedictorian. Miss ND — bless her heart! — lists “accelerated math placement,” and Miss WA graduated high school with AP credits. Platform Names So Grammatically Jacked That Somewhere, Fifth Grade Teachers Are Weeping: This field was alarmingly packed this year, but the hands down winner has to beMiss DC, a Phi Beta Kappa graduate of UNC, who went with “Makeup's Should Be Makeup.” I mean, I…can’t even. WHAT DOES THAT EVEN MEAN? Runner ups: Miss PR’s yodalike “Children's Neglect and Abuse, Preventing with Love,” (OK, OK, maybe English is not her first language?) Miss AL’s “Chandler's Challenge: Reading is Believing - Don't Stop Believing” and Miss UT, with “Child Sexual Abuse; Recognition and Recovery.” (My platform? Friends Don’t Let Friends Abuse Semicolons.) And a special grammar police shoutout to Miss Virgin Islands, whose bio tells us she attends the “Universitty of The Virgin Islands.” Proofreading matters, people. Jennifer Mendelsohn is a seasoned journalist and ghostwriter. She currently serves as one of Us Weekly's Fashion Police "Top Cops" and helped TV star and fashion guru Carson Kressley pen his New York Times best-selling style manual Off the Cuff. Mendelsohn was a longtime Washington, DC-based special correspondent for People and wrote the satirical "Keeping Tabs" column for Slate. Be sure and follow her on Twitter during the pageant! Images via The Official Miss America Facebook page and MissAmerica.org.